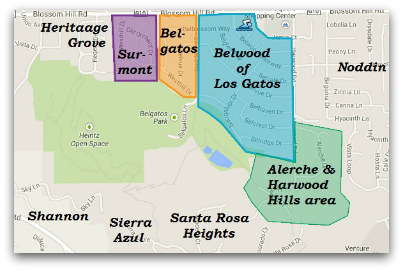 Just west and south of the intersection of Blossom Hill Road and Harwood Road sits a neighborhood of Los Gatos homes with three subdivisions: Belwood of Los Gatos, Belgatos & Surmont. Nearby public landmarks are Belgatos Park and the Walgreen’s shopping center (corner of Blossom Hill and Harwood), with a Mountain Mike’s Pizza and a Starbucks coffee shop. One hill attracts kids who enjoy sliding down it on bits of cardboard, and thus has been nicknamed “cardboard hill” for decades. Most of the time these cardboard sledding enthusiasts are pretty good about picking up their “sledding vehicles” when done. The paths are popular with people on foot, but also those on mountain bikes or horseback. As there are a few larger properties which are zoned for horses in the area, this is a very nice equestrian option. For photographers, the park has abundant worthy subjects year round, both of the open space and the valley views below. In the early morning hours, or near sunset, you may see some deer too. But be careful: bobcats and mountain lions are in these hills also. What are homes like in Belwood, Belgatos and Surmont? 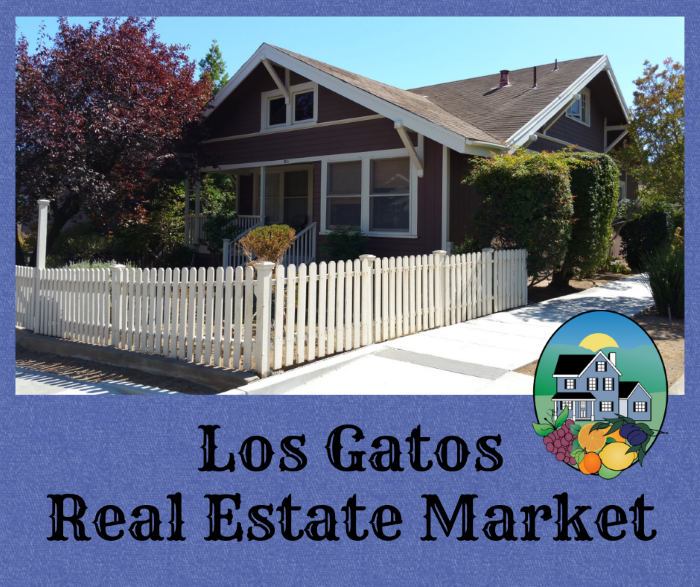 There are many factors impacting the Los Gatos real estate market, including the price point and the elementary or high school district. This post is updated every month or two. 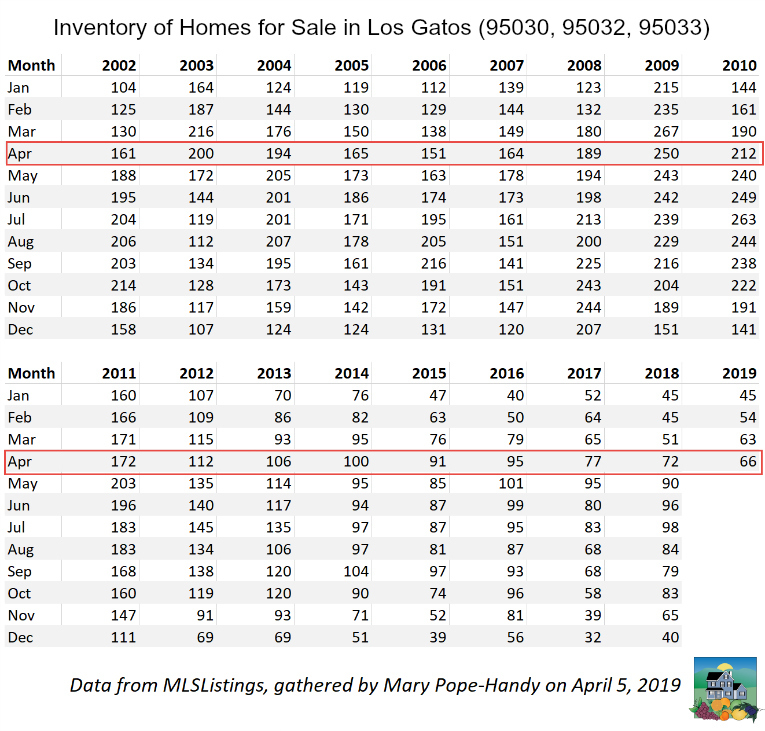 Today we’ll look at the Los Gatos realty market by pricing tiers and high school district using the months of inventory as a data point. 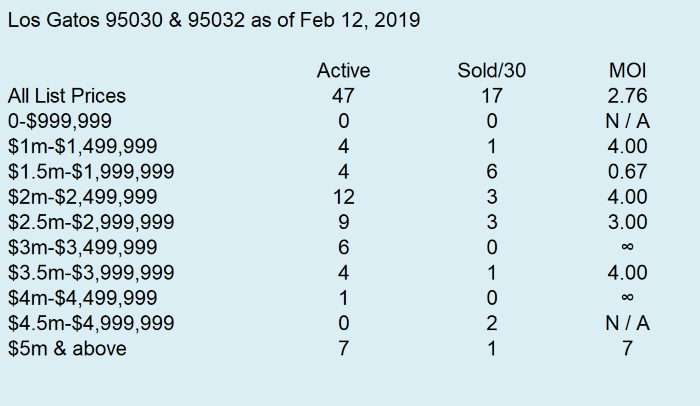 The months of inventory, or MOI, is the currently active (for sale, no contract or pending sale) homes for sale divided by the number of homes using the same criteria which have closed escrow in the last 30 days. 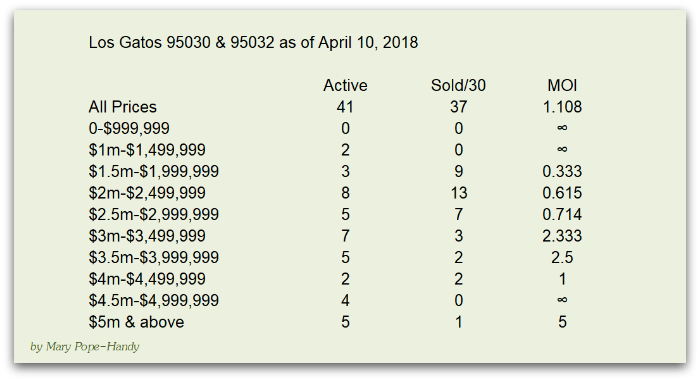 These numbers were run today using MLSListings.com and it’s possible that a few more homes will be recorded as closed sales or new homes added to the market after I ran these numbers. 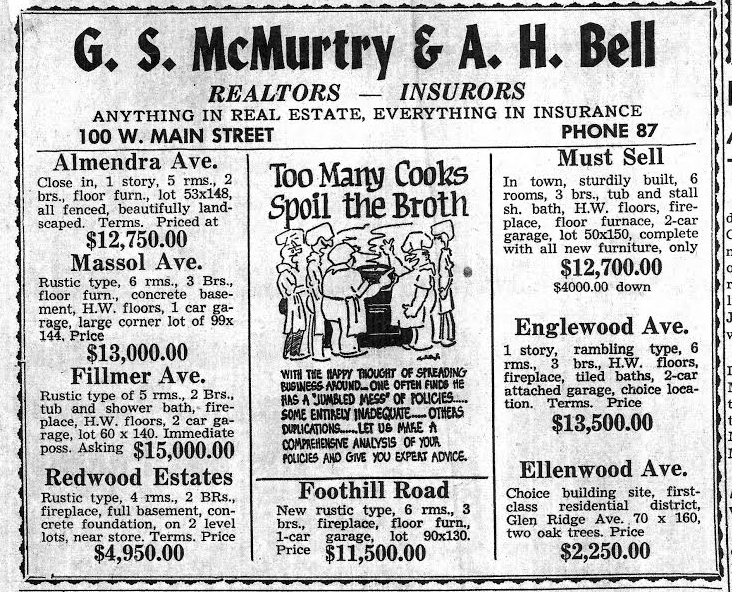 One other disclaimer: sometimes the number of closed sales is very low or is at 0. This can be for many reasons. In some cases, there are a few which are sale pending and simply haven’t closed recently. In other cases, the market might actually be empty in those tiers, indicating a possible lack of demand or inventory. That being said, what do the numbers say? 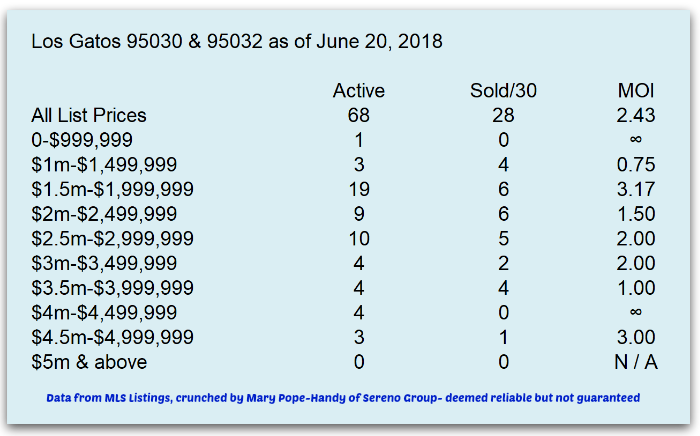 The overall MOI for the town as a whole with 95030 and 95032 zip codes shows a slightly weakening market, likely in what is a typical seasonal pattern. It is a bit of a mixed market when looking at the town as a whole, but less so when viewed by high school district or price point. February is often a time when markets heat up considerably. 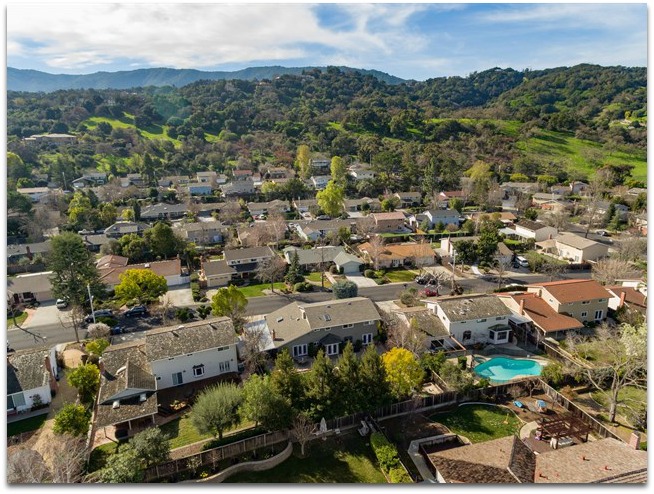 We’ll see when the month is over, but already in many parts of Santa Clara County, the real estate market is returning to seasonal patterns with some very hot pockets. 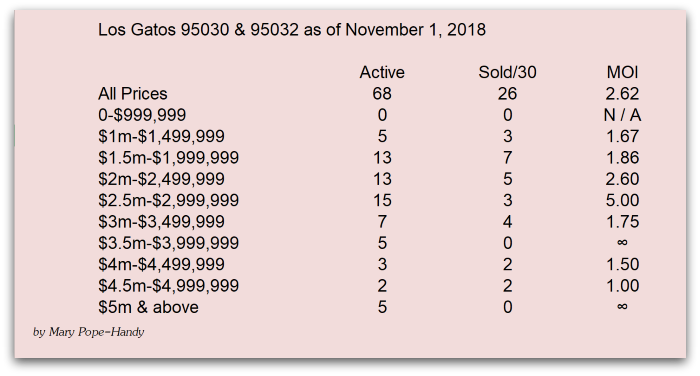 Same info for last November – the overall absorption rate isn’t much different now, but there are a lot few sales happening. 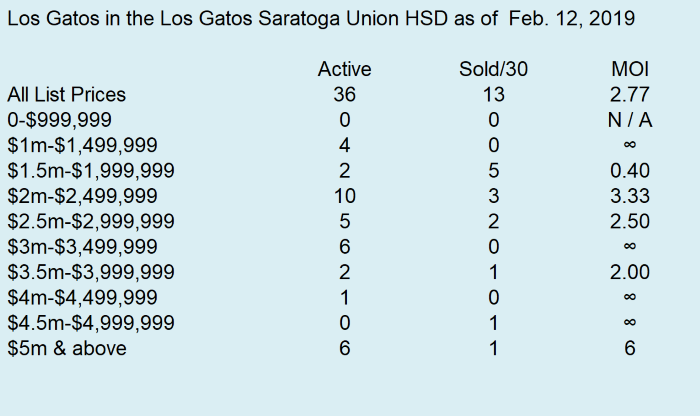 Now let’s view just the homes which are in the Los Gatos – Saratoga Joint Union High School District (or homes “in the schools” as locals say).Houses for sale with Los Gatos schools tend to be more pricey than those in neighboring school districts. 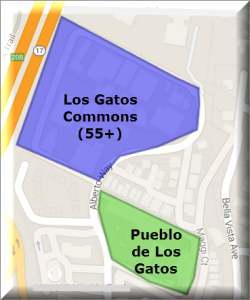 This isn’t just the schools, but is also a function of being closer to downtown Los Gatos. 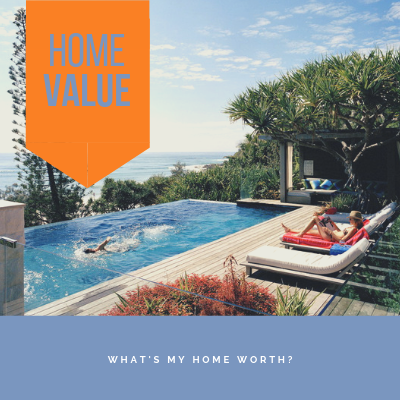 The lowest priced homes in this area are seldom listed for less than $1 million. 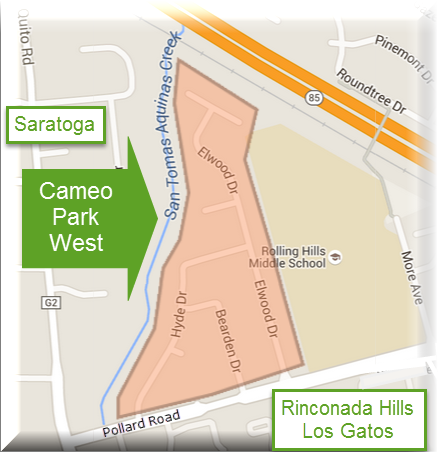 As with most senior housing, the units at The Commons are more affordable than the majority of Los Gatos condos. The Commons was built in 1978 and requires that at least one resident be 55 years of age or more. As of 2018, you may be able to purchase a tiny 1 bedroom in the Commons for under $700,000. 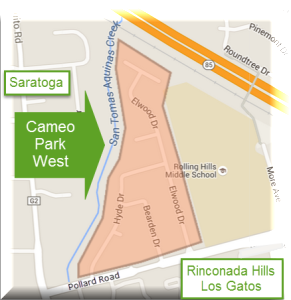 A smaller condo community just a little closer to Los Gatos-Saratoga Road, and on the opposite side of Alberto Way, is Pueblo de Los Gatos. These homes are a little further away from Highway 17, are a little quieter, and are not senior housing. They tend to sell for a little more than the homes across the way. 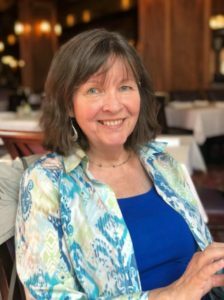 There seems to be about a 5% to 10% difference in price, most of which may be attributable to freeway noise, but part of it to the “senior community” status. This property was developed in 1970, so is actually a little older than the Commons. Pueblo de Los Gatos consists of 53 units. Of these 53 condo units, 1 of them is a 3 bedroom (unit # 1, which also has a large 2 car garage), 44 are 2 bedroom units, and 8 are 1 bedroom units. Except for unit # 1, the rest of the homes in this community have carports. 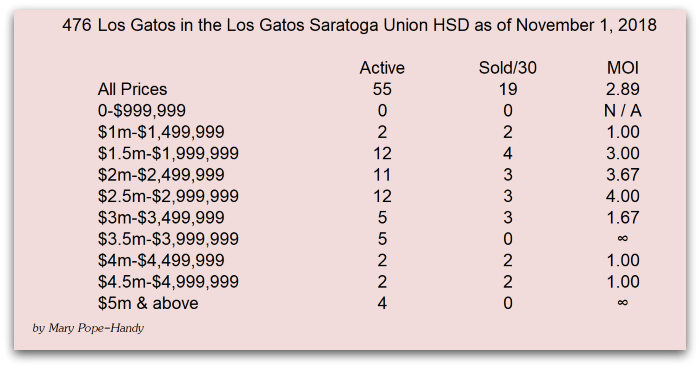 For many home buyers, these properties offer a more affordable way to get into the Los Gatos Union School District than might otherwise be possible. Additionally, there is a small townhouse complex on the same side of the street as the Los Gatos Commons. These are also not senior communities. What is the fastest way to tell them apart? The easiest way, without even clicking on a link, is to spot the address. If there’s a letter as part of the unit number (as in A100 or B202), it’s part of The Commons. If there’s no letter, as in #7, it’s part of the Pueblo de Los Gatos. Of course, there are other townhomes in the immediate area, too – but these are the largest communities. 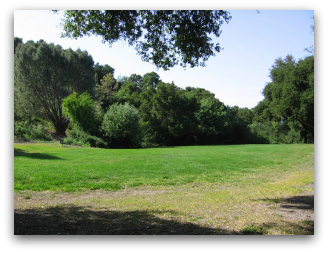 Both of these are in close-to-downtown Los Gatos locations. If you’re in the market for Los Gatos real estate and would like to live close in, this is a great street to check out. See all Los Gatos Commons.